If you’re looking for a Clearfield moving company that provides professional moving services without the outrageous price tag, check out Moving Connections. Moving Connections is home grown, right here in Northern Utah. 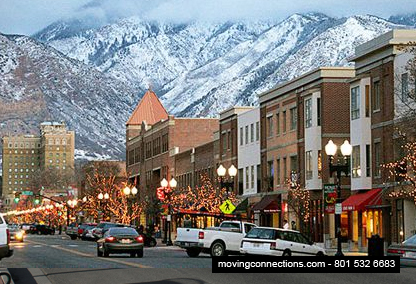 We’ve been in business for more than thirty years and we’ve learned a thing or two about providing top tier moving service to our clients along the Wasatch Front. And although we’re down to earth and so are our prices, we maintain a high level of professionalism in the moving industry. That’s why we are federally licensed, bonded, and insured, with our own Motor Carrier number. Moving Connections hires only the best. We hire only those moving team members who are experienced in the moving industry, so we maintain top flight professional moving crews. We also provide a full range of related services, such as home staging and climate controlled storage areas, plus a host of other services. We also have a very simple and straightforward pricing policy so that there’s no sticker shock when you’re handed a bill at the end of the move. All Moving Connections charges for is our crew’s time plus non-reusable items, meaning boxes and tape. We don’t even charge for stretch wrap, even though we use a lot of it. You just pay for time and boxes and tape. And that’s fair and honest. Because Moving Connections doesn’t have add-ons such as fuel surcharges, taxes, or charges for equipment or tool usage. If Moving Connections is moving you to Clearfield it's a perfect time to begin to utilize the many resources and bounties of Clearfield. For example click on the picture to the left to go the Moving Connections 'Support - Advice - Assistance' page and discover Clearfield for the first time. Once you are on the 'Support - Advice - Assistance' page go ahead and open the .pdf link found there and tape the list of emergency and useful phone numbers on your refrigerator. Moving Connections has gone to great pains to find those links and connections to integrate you quickly into Clearfield life. Moving Connections is a full service professional moving company. As such, we provide not only the service of packing, loading, driving, and unloading your household goods, but we also provide staging services as well as storage areas for your convenience. We even offer climate controlled storage. Moving Connections’ full service residential moving option is a top notch service because we field the best professional moving crews in the state. They consistently get top ratings for cheerfulness, efficiency, and skill. Moving Connections is an affordable local mover that is not part of an impersonal national chain. That’s what makes us affordable, even though we’re federally licensed, bonded, and insured. Moving Connections has a Labor Only option in which our moving crew provides the expertise and the muscle, but you provide the truck and driver. Since our primary cost is time for labor (driving, packing, and loading/unloading), you stand to save big money by doing your own driving and unloading. Our Clearfield Labor Only crew still wraps, packs, and loads your truck to industry standards for a safe journey and efficient use of space, so you don’t have to worry about that. But you do have the benefit of shaving off a large amount of the labor and driving costs by hiring your own truck and driving it yourself. Moving Connections has handled a lot of business moves, from small office moves across the street to corporate relocations. Whatever your needs are, Moving Connections stands ready to provide the best moving help possible in your business move. We at Moving Connections understand that businesses need to remain up and running as much as possible. That’s why our representatives will coordinate with you to help plan the most efficient move possible and to keep your business operating throughout the duration of the move.